Organic produce goes through process of Organic certification. Organic certification ensures that there is no use of chemicals in the whole production process in farmers field. Such organic certified food gets the organic labels. Organic labels also stimulate the consumer to view the product as having more positive nutritional value. The established organic label through such organic certification process develops a positive faith among the consumers. 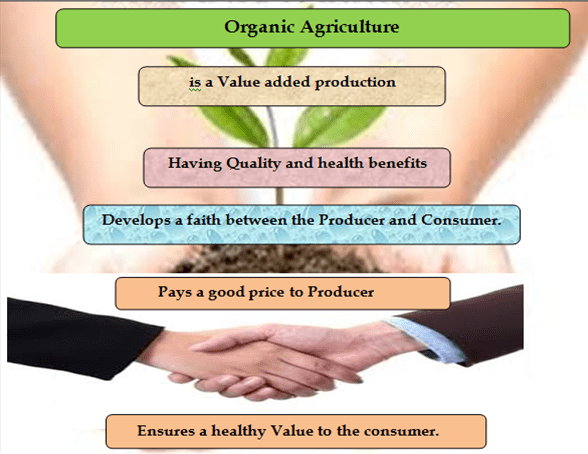 Organic Agriculture as an assurance for quality life is being well justified with health benefits of organic foods. Too much use of chemical fertilizers and pesticides in Agriculture has resulted in threats to human life. The consumers now days are more health conscious. The increase in number of morning walks by most of people in different aged group signifies their concern for health. Along with regular exercises and body movements, they have shown equal concern on intake of healthy food .The organic food with its natural qualities and nutritional value is much in demand. The organic certified produce with organic labels is the sign of satisfaction for the consumer.The organic way of producing agriculture crop put a check on the presence of harmful chemicals in harvested produce. This makes the harvested produce safer to health of consumers. Hence, Growing Agriculture produce in organic way is a sort of Value addition to harvested produce. This enhances the significance of adopting Organic agriculture. Farmers’ adopting organic way of agriculture production not just ensures the health of consumers. They also ensure a healthy soil. The soil microorganisms are benefited by the use of organic inputs by the farmers. This enriches the soil biodiversity.This in turn ensures the sustainability in Agriculture.Along with sustainability, the biodiversity of soils ensures quality production that satisfies the consumers demand for safer and healthy food. Earlier most of the farmers in want of quick and high production have never considered the significance of sustainability in agriculture. 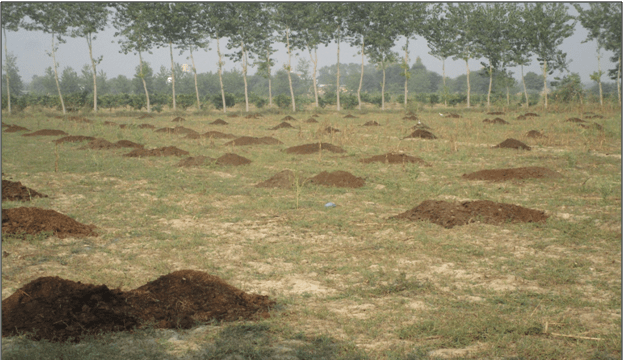 The farmers, especially in North western part of India have seen the ill fate of soil as a result of excessive use of chemicals in Agriculture. The conversion of productive land in to saline –Alkali soils made them to think sustainability as an important factor in Agriculture. The significance of organic labels has started penetrating the mind of farmers. Realizing the importance of Organics in Agriculture, the farmers are focusing more on organic farm inputs and adopting organic Agriculture.The organic produce fetches better market price to the producers and ensures consumers satisfaction for health. The use of decomposed cow dung is playing an important role in Agriculture. The decomposed cow dung contains almost all necessary nutrients required for the plant growth. In addition, it creates a condition congenial for growth of soil microorganism. It enriches the soil biodiversity. Organic agriculture ensures all types of foods required by micro flora and other essential life forms. Sufficient dry organic matter for the small insects fully decomposed organic matter for microorganism and semi decomposed organic matter for the earth worms are required for the survival of diversified micro flora in the soil. The use of organics has provided a natural environment for better flourishing of the soil biodiversity.The organic produce with organic labels certainly acts as consumers satisfaction for health.